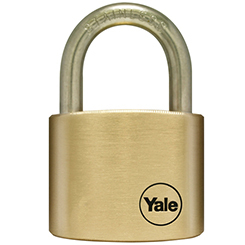 YALE is among the most respected names in the lock industry, with millions of their locks in use worldwide. If you value it, Yale will find a means to protect it. They are the brand behind locks such as Door Locks, Padlocks and Digital Door Locks as well as Safes, Door Handles, Alarms and more. The traditional YALE lock remains a dependable security solution for the home owner, however the brand’s past successes are built on their drive to continuously strive to be better. They have recently introduced a new range of Smart products incorporating intelligent technology, so you can conveniently unlock and monitor home security on-the-go, using your own personal mobile device. Committed to finding you a cost-effective solution for your home, YALE’s doormaster range allows you to replace just the lock, instead of having to replace the whole door, making the job an easier fix and much more affordable. With a vast choice of products and many more innovations to come, Shop YALE at My Tool Shed and find the solution that’s right for you.